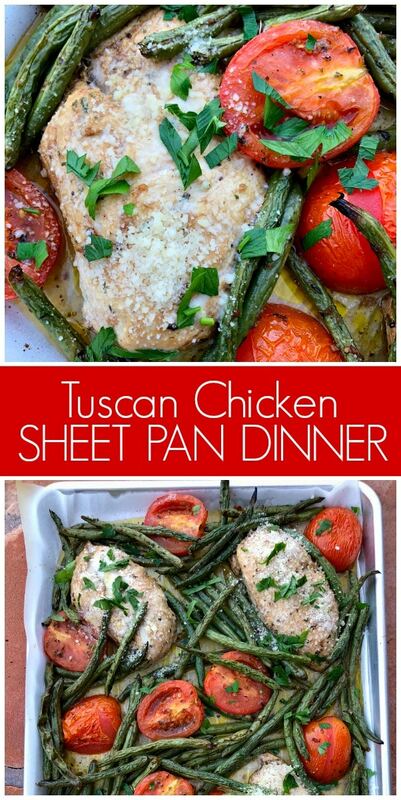 This Tuscan Chicken Sheet Pan Dinner recipe is a super easy dinner recipe to put together when you don’t have a lot of time to cook. If you’re not familiar with “sheet pan” type dinners, this is a relatively new way of cooking that teaches you how to prepare your entire dinner on a sheet pan- vegetables and all! 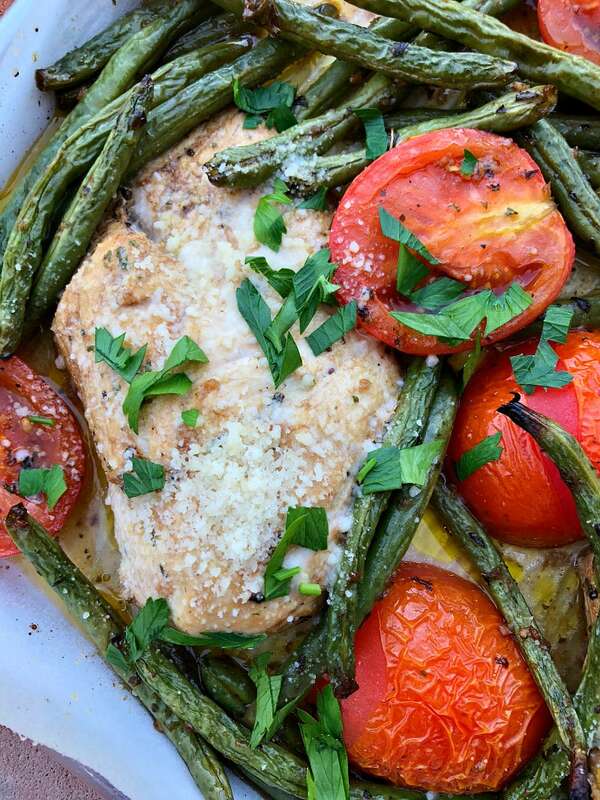 In this recipe, you have four chicken breasts with green beans and tomatoes. It’s an all-inclusive dinner. I don’t do book reviews that often, but this recipe comes from a sweet friend of mine: Ree Drummond. I love to review books from friends who I know to be super talented recipe developers! 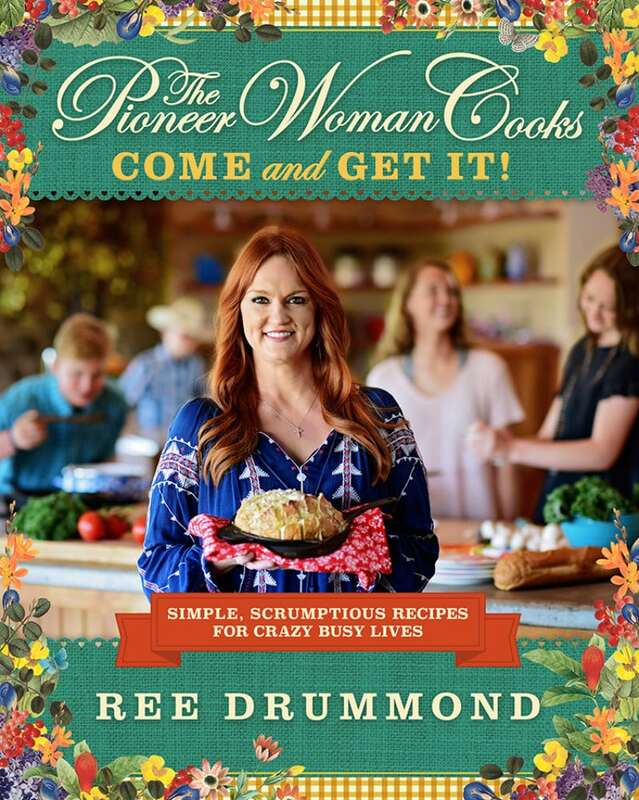 You probably know Ree Drummond as The Pioneer Woman- either from her website or TV show on Food Network. I know Ree as an early-days blogging friend who is sweet as can be. It has been pretty fun to watch her bloom into fame. 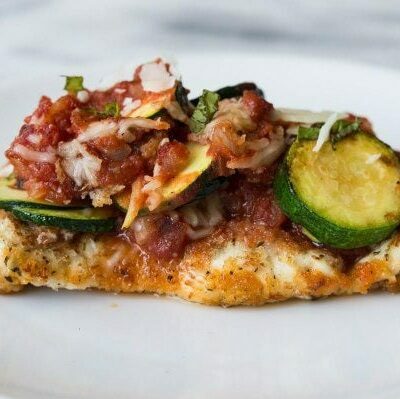 The Pioneer Woman Cooks: Come and Get It! is the newest cookbook from Ree Drummond. In this book, Ree focuses on simple, scrumptious recipes for crazy busy lives. This applies to a lot of people, so I feel like this is a super useful cookbook to add to your cookbook collection. The book includes recipes for all meals of the day. A few recipes that have caught my eye are Crunchy French Toast Sticks (breakfast), Salad on a Stick (lunches on the go), Slow Cooker Beef Enchilada Dip (apps and snacks), Smothered Pork Chops (under 40 minutes), Honey Soy Salmon (under 20 minutes), Meatball Tortilla Soup (take your time), Steak and Bell Pepper (sheet pan suppers), Greek Grilled Eggplant Steaks (meatless marvels), Funeral Potatoes (sensational sides), Confetti Cornbread (bread, baby! ), and Nutella Krispie Treats (sweets, glorious sweets). This book is substantial— big— lots of recipes with lots of photos. I love it, and it’s one that I’ll reach for again and again. 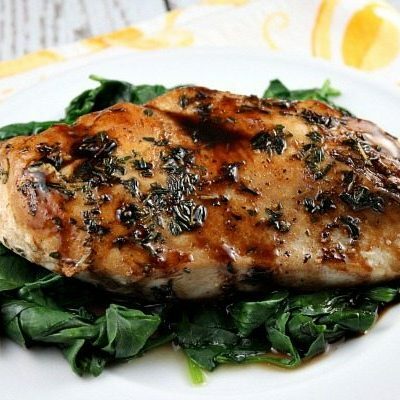 In this recipe, you’ll marinate the chicken in a balsamic dressing. You’ll also marinate the green beans and tomatoes in the same balsamic dressing. Then you’ll dump the dressing and spread out the goods onto a sheet pan. I like to line the sheet pan with parchment paper for easy clean up. It takes only about 25 minutes (depending upon the thickness of your chicken) to roast in the oven. 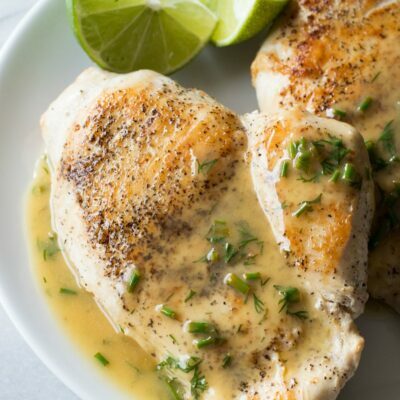 you want to make sure your chicken is cooked all the way through (so it’s helpful if your chicken breasts aren’t super thick– and they should all be around the same thickness). Once out of the oven, you’ll sprinkle the chicken with parmesan cheese and add some fresh parsley too. I love the way the tomatoes and green beans take on a blistered appearance when roasted. It’s all good! 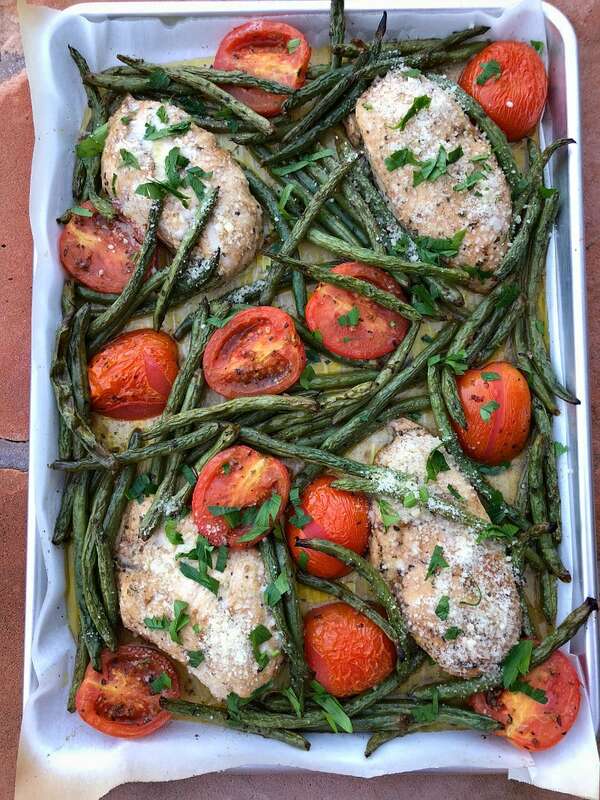 We love this super easy Tuscan sheet pan dinner recipe! If you are looking for easy dinner recipes, you might also enjoy my Sheet Pan Paprika Chicken or these Sweet and Spicy Chicken Lettuce Wraps. Million Dollar Spaghetti, Cajun Cheesesteak Sandwiches and BBQ Chicken Tostadas are quick and easy dinner recipes too! 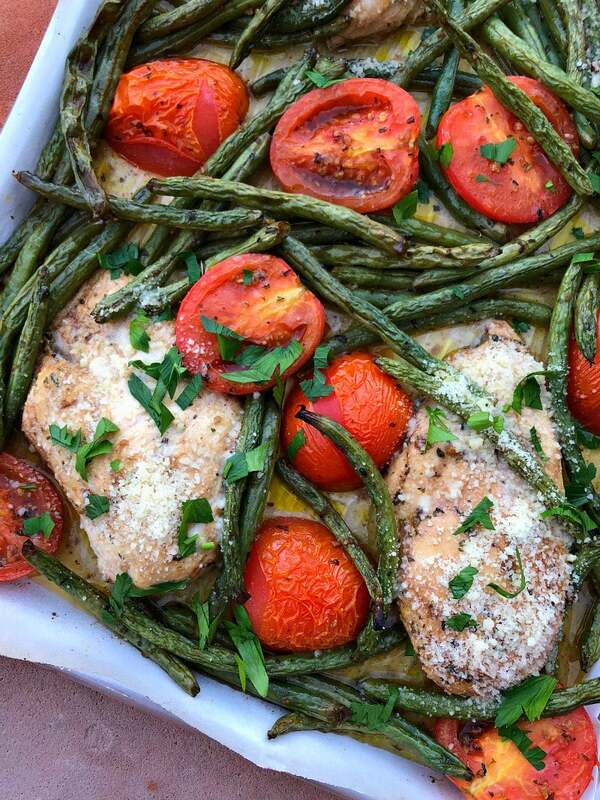 This dinner is so easy to make- all in one sheet pan. Delicious too! In a bowl or pitcher, combine the olive oil, balsamic, garlic, parsley, basil, salt and pepper. Whisk until the marinade is emulsified. Place the chicken in a large zip bag and pour in half the marinade. Seal the bag and set it aside. 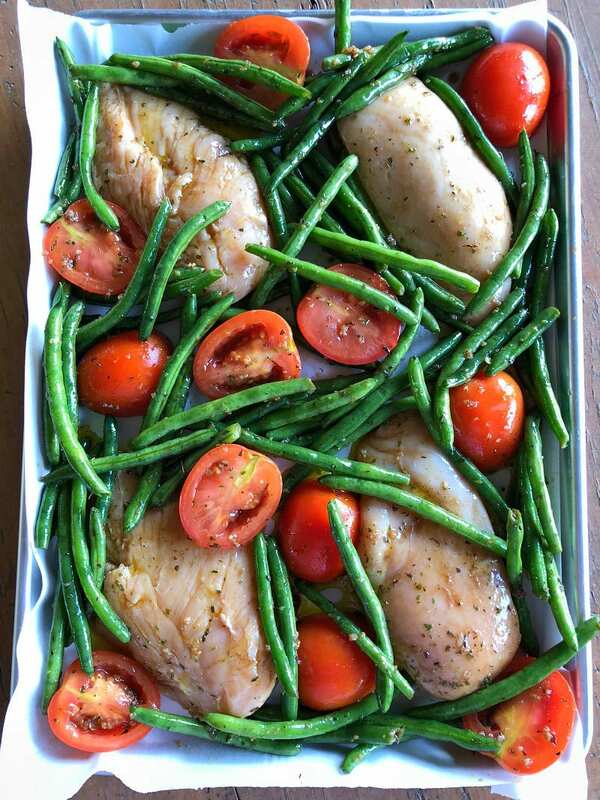 Place the tomatoes and green beans in a separate zip bag, and pour in the rest of the marinade. Seal the bag and marinate both bags in the refrigerator for up to 2 hours (or make it right away-- but it would best to marinate for at least a little bit). Preheat the oven to 425 degrees F. Arrange the chicken and veggies on a sheet pan, and discard any marinade left in the bag. If you want to make your clean-up easier, line the sheet pan with parchment paper. Roast for 25 minutes, gently shaking the pan once during that time. The chicken should be cooked through and the vegetables starting to brown nicely. Sprinkle with Parmesan cheese, sprinkle with fresh parsley and serve. 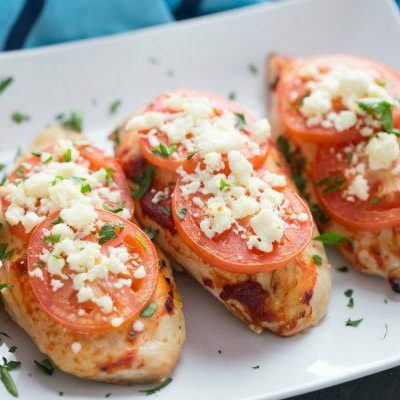 WAYS TO CHANGE IT UP: A few minutes before the chicken is done, lay slices of fresh mozzarella on each breast. Return to the oven until melted. Or serve with crumbled feta cheese all over the top. Because this recipe uses a marinade, the nutritional information is estimated. 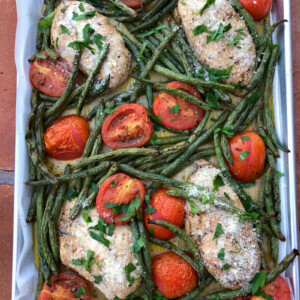 It is estimated that four tablespoons of the olive oil will be actually absorbed into the chicken and green beans.